SHOPPERS at a major retailer have been asked to back a Bognor Regis-based charity this year. 4Sight Vision Support has been chosen to benefit from the latest Co-op Local Community Fund. Customers of Co-op shops in the area can support the charity when they buy own brand goods. Co-op members receive a five per cent discount on the items and a further one per cent goes to good causes in the area around the shops. A spokesman for 4Sight Vision Support said: “We really hope that you will take this moment to visit the website and choose to support us. 4Sight Vision Support is raising funds to make a positive difference for people in the county who are living with sight loss. “We want to offer free low-vision assessments to people with sight loss, protecting their remaining sight and continuing independence. “People whom are sight-impaired frequently find themselves presented with barriers to work, education, travel and leisure,” the spokesman said. The approach of 4Sight Vision Support, based in Victoria Drive, supports the mental and physical welfare of visually impaired people. It also seeks to raise awareness of eyesight health and reduce the chances of further deterioration. The small team of staff and 300-plus volunteers support 32 social and activity clubs and three resource centres. 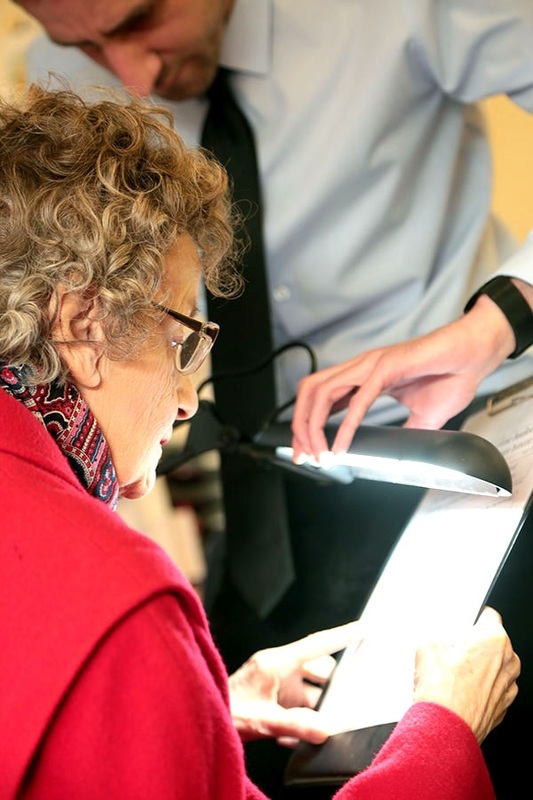 One of its members is pictured above being assessed on her vision with a light for clearer sight.